ISIS is spreading to Libya, Afghanistan and Pakistan, the head of Canada's spy agency warned at the Senate defence committee Monday. ISIS is spreading to Libya, Afghanistan and Pakistan, the head of Canada's spy agency warned at the Senate defence committee today. At the same time, Michel Coulombe, the head of the Canadian Security Intelligence Service, urged senators not to forget longer-running foes like al-Qaeda as Canada turns its focus to the Islamic State in Iraq and Syria. "ISIS started in Iraq and Syria, but what we're seeing now, and you've seen it in media, it's spreading in Libya, Afghanistan, Pakistan," Coulombe said. "Boko Haram just pledged allegiance to ISIS. So there's also this phenomenon of ISIS spreading." Canada's top security officials are appearing before the Senate defence committee today over the government's plans to extend the reach of CSIS overseas. Coulombe and Public Safety Minister Steven Blaney kicked off the meeting. 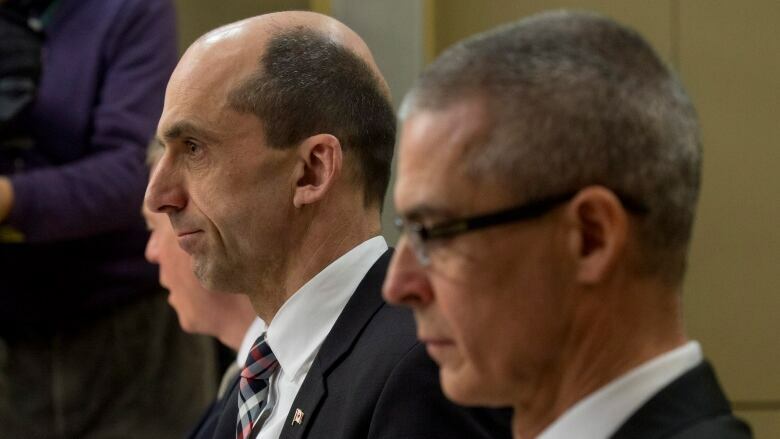 Other top security officials, privacy commissioner Daniel Therrien and former CSIS assistant director of intelligence Ray Boisvert also briefed senators. The officials discussed Bill C-44, proposed legislation that would let CSIS work outside of Canada and better protect the confidentiality of its sources. Right now, CSIS is barred from working outside Canada. The bill was tabled in the House five days after Michael Zehaf-Bibeau shot and killed Cpl. Nathan Cirillo at the National War Memorial in Ottawa and stormed Parliament Hill last fall. Another bill, C-51, is a much longer piece of proposed legislation that also aims to increase CSIS's powers, including giving the spy agency the ability to ask a judge for permission to contravene the Charter of Rights and Freedoms. C-44 aims to protect confidential sources used in national security cases, even keeping the identities from a judge, and give CSIS explicit authority to operate both inside and outside of Canada, even if that breaks the law in other countries. The Conservatives last fall shot down requests for additional CSIS oversight to go along with the increased powers. Government officials have argued against increased oversight in the debate over Bill C-51 too. Bill C-44 would also allow Canadian intelligence operatives to ignore the laws of the countries in which they operate as long as they obey Canadian law. Officials appearing at a House of Commons committee last November weren't able to name any other country among the so-called Five Eyes partners that has the same provision. The Five Eyes partnership is an intelligence agreement between Australia, Canada, the U.S., the United Kingdom and New Zealand. Allow for some exceptions, including disclosure of informants' identities "if the human source and the [CSIS] director consent to the disclosure of that information." Lay out the process by which a judge could order that an exception be made. Make it an offence to divulge any information that would lead to the disclosure of the identity of a CSIS employee "who was, is or is likely to become engaged in covert operational activities." Public Safety Canada Deputy Minister Francois Guimont, another witness at the hearing, was also asked about how Canadians can be assured that CSIS is subject to adequate oversight. Guimont said that while the security intelligence review committee (SIRC) is at the centre of that review capacity, the auditor general also can, at any time, review aspects of CSIS. "So there's the department, the minister, my accountability, there's SIRC in the middle, and there's also the [office of the auditor general] that can, from time to time, may decide to review any aspects of CSIS operations." However Ghislain Desjardins, a spokesman for the auditor general's office, told CBC News that while the office pays particular attention to requests for audits from parliamentary committees, "at this moment, our current planned audits do not include CSIS."